The Sweet Cream Base is uncooked, so if you have concerns about raw eggs, you can buy pasteurized. I used local eggs and went with the heavy cream. I chose to add the liquid from macerating the strawberries to the base, and then added the strawberrries at the end. It gave the ice cream a beautiful pink color without having to use any food coloring. This was so good, I actually had to hide half of it from my guys to keep them from devouring it all. I needed it for another recipe I'll be sharing soon. 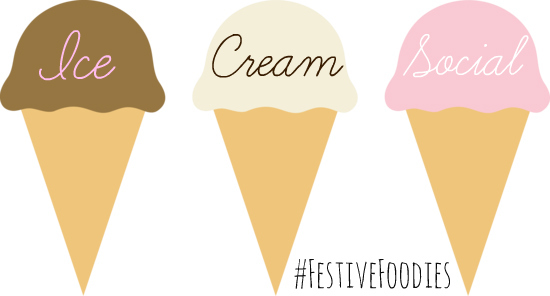 Thank you to all of the #FestiveFoodies for joining in with me, I'm very happy that I got to host the #IceCreamSocial this time around! Combine strawberries, lemon juice and sugar in a bowl. Cover and refrigerate at least 1 hour. Prepare the sweet cream base. Whisk the eggs until light and fluffy, 1 to 2 minutes. Whisk in sugar, a little at a time until completely blended. Pour in cream and milk, and the liqud from the strawberry mixture and whisk to blend. Pour into your ice cream maker, and freeze according to the manufacturer's directions. Once ice cream stiffens, add the mashed strawberries and continue to freeze to desired texture. 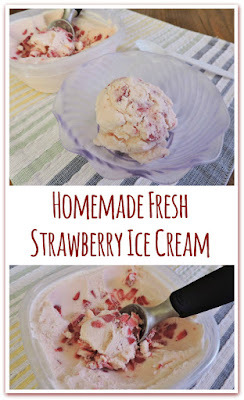 *I churned mine using a KitchenAid ice cream maker attachment for about 25 minutes, added the strawberries and then ran it about 5 minutes more. I moved the ice cream to air tight containers and let it freeze for a few hours before serving. I LOVE homemade strawberry ice cream and your recipe sounds perfect. Oh how I adore strawberry ice cream but this fresh version with the actual chunks of strawberries is PERFECTION!! So pretty and so much better homemade! Having fresh strawberries in strawberry ice cream sounds delicious. I can't wait to try this. I love the strawberry chunks in there, sounds delicious! Strawberry is a favorite in our house!